Fantastic! I got it going, I think my problem was the crystals and it's connect capacitors. I tried a blank board and used a higher pf value and it all worked. @tronicgr could you help me please? the problem: i got some pro micro clones with arduino leonardo bootloader already flashed and i don't want to flash them again, so i have to change the code (i think so...!?!?). on the pro-micro-pcb i DON'T want to occupy pin 16 MOSI, 14 MISO, 15 SLK due to reprogramming reasons (if bootloader fails ...). so i have to use pins higher than pin#16 but i don't know how to chaged the define commands correctly. i think the number behind the define command is the pin port??? This code simply loops round from 0 to 13 and sets each pin to a pull-up. Grounding the pin represents a button press. so to remove the void setup code just replace it with this? do you have an idea how i can handle the 16 MOSI, 14 MISO, 15 SLK pins? Poppy McDoh! wrote: so to remove the void setup code just replace it with this? Sure, it'll do the same thing. You can just omit the pins you don't want to configure. do you have an idea what this means? now i loaded the sketch onto the arduino leonardo. everything compiled fine and upload was successful. now windows detects the usb device again and tries to install a driver for it (should be HID gamepad...!?) but the driver installation fails after several minutes. i sticked the board into another usb port. now windows does not detect anything! dead. but how can this be??? solved by re-flashing it with "Bootflash_program_gameboy.hex". 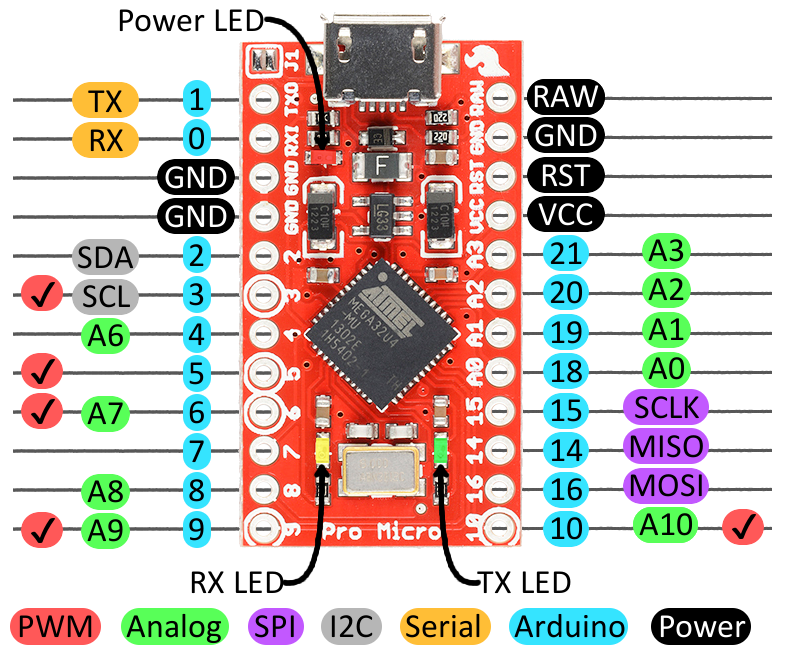 now its being detected as sparkfun pro micro. Last edited by Poppy McDoh! on Tue Oct 25, 2016 7:10 am, edited 2 times in total. now i loaded the sparkfun pro micro settings in arduino ide and flashed my code to the chip. it works. but somehow the button allocation is not what i want to send. for example receiving "11" and "12" in windows/gamecontrollersettings when pressing BTN_TURBO or BTN_SLOW does not work at all! solved by changing whole pin layout and mapping. @ tronicgr: why did you set the E fuse to the following value? voltage via USB will always be at 5V, so why is BOD enabled? and why 2.6V? is it necessary? if you disable BOD (value = CF / FF) you can save some more current. also remove the LED and the voltage regulator from the "pro micro pcb". power. In the deeper sleep modes, this will contribute significantly to the total current consumption. EEPROM, and the same design solutions should be applied. execute instructions incorrectly, if the supply voltage is too low. is your green LED (TXD) ON all the time?